At Westie ReHoming we are not here to judge the reasons why you may need to rehome your dog and fully understand that circumstances can and often change. We fully respect that this will be a very difficult decision for you and are here to ensure that your dog goes to the best possible home. Our adoption process will ensure this, and we will focus on the westies needs at all times. Is rehoming the only answer? It is sometimes possible for us to give advice and support to enable you to keep your westie, this has often worked well in the past and avoided the heartache of giving the dog up for adoption. Please ask if you feel that this may be a solution for you and we will do our best to offer advice. If rehoming is inevitable we will send you a Dog Profile Questionnaire for you to complete and return to us. This will enable us to get to know your dog better and do the very best for it when deciding on a home. The answers you give will also help us in the future if there is a problem with the dog. Our behavioural training will enable us to interpret the answers you give about health or behaviour issues and be able to have more idea about ‘what makes him tick’. Please be totally honest with your answers. If he/she has a problem it doesn’t mean that we won’t take him, it just means that we are more able to cope with a solution and know best how to support him through it. We will ask for your vet details in case we need information from them and ask that you contact your vet letting them know of your decision to rehome, and giving your permission for them to tell us anything that we need to know that will help in order to comply with client confidentiality and data protection. Having entrusted us with the care of your dog during the rehoming process you can be confident that he/she will only be in the care of our experienced registered volunteers at all times. We cannot allow anyone that isn’t registered with us as a volunteer to handle, care for, or transport to be put into such a position of responsibility thus putting themselves or your dog in danger, and invalidating our insurance. Can I meet the new owners? Due to our confidentiality clause we are not allowed to give the details of either party to the other. We can give you an idea of the home that he/she is going to and an approximate location, but nothing that will identify the new owners. We are sure that you will be able to understand the reasons for this and maybe even feel reassured. You are welcome to contact us to ask about your dog after it has been handed over, and we are always happy to act as a ‘postbox’ for messages or maybe photos in either direction. It would be helpful if you could send along anything that is precious to your dog such as a blanket with familiar smells on them, bed, favourite toys, that will be familiar and therefore help him to settle. Any food that you have left over would be good too, to ensure continuity. We do not charge for taking your dog in, but donations are always welcome. We receive no government or public funding and are totally reliant on donations and the funds raised by our volunteers. None of our volunteers receives remuneration apart from direct out of pocket expenses such as fuel costs and 100% of donations goes directly towards the running of the charity and the dogs’ welfare costs. Having registered your dog with us for rehoming we ask that should you make other arrangements for its future you let us know immediately. We all work very hard for the benefit of the dogs and give our time totally free of charge. We therefore can’t afford to waste time that could be given towards the welfare of another dog that needs our help and hope that you will respect this. Because we do not have kennels we need to wait for a suitable foster space before we can take your dog. In the mean-time please don’t ever be tempted to advertise your dog free to a good home in the free ads. With the best will in the world you shouldn’t entrust your dog to a stranger who may not have its welfare at heart There are too many people posing as good, caring people wanting to take the animal in, when what they are actually interested in is cruelly exploiting animals for their own ends, and these people can be very plausible and convincing. Once a pet is no longer in your care, you have absolutely no control over who it gets passed on to, or what fate it may meet. When rehomed through a responsible ‘rescue’ the new owner will need to sign a legally binding contract ensuring the dog’s future welfare. We are here to help and to support you through the difficult decision to rehome your dog, please contact us if you feel we can help. "I was heartbroken when I had to rehome my beloved Keltie. My husband had left me and I had to work long hours to make ends meet. I soon realised that I was being cruel to Keltie and it was beginning to show with her. I called Westie ReHoming for advice and they were so kind, never judging me or rushing me into my final decision. As hard as it was to say goodbye, they helped me through the worst time of my life with their support and compassion. I am happy that Keltie is now loved by a very caring family and I know that she has adjusted well to the change. I will never forget her, but will be forever grateful to Westie ReHoming for helping me to do the best thing that I could for my beloved girl at that time. 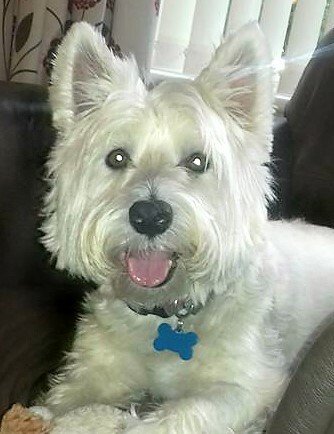 I would recommend them 100%"
Westie Re-Homing has found and given my little Alfie the perfect home. My husband passed away 2 and a half years ago, Alfie was his constant companion all through his illness, they were so close. After he passed away I struggled to give Alfie the attention he used to get from my husband. We were all grieving in the home which I believe affected little Alfie. When we all returned to work Alfie was on his own a lot which he had not been used to, I felt so guilty leaving him, so with a heavy heart I contacted Westie Re-Homing to help me. They told me straight away that they would find him a home to suit his needs. Two weeks later, Alfie has lovely new owners and is loving his new home, he has company all the time and they understand his needs which has given me peace of mind. Thank you so much to you all, the whole rehoming/adoption process has been carried out with so much care and love for the dogs concerned. I have received updates on Alfie with gorgeous pictures showing him in his new home and garden. I miss Alfie everyday but I know he is happy and being cared for with lots of love. Westie Re-Homing is amazing, I class them as my friends and thank them all with all my heart.